Like our prior set of charts, the following VIX graph from Birinyi Associates discusses a measure of sentiment hitting an extreme measure -- they call it "extreme volatility." "Over the last 50 trading days the CBOE Volatility Index (VIX) is up over 100% which is an occurrence we have seen in only five other periods...The chart of the S&P 500 highlights the first day of each of the prior periods where this occurred. Each of these prior occurrences have coincided with market weakness, which was then followed by positive returns." 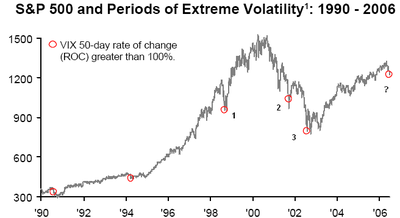 However, the 3 most recent prior examples of extreme volatility did, and I have annotated them with numbers 1, 2 and 3 (This week's example is marked "?"). Note that the prior 3 VIX events all had a response from the Fed of massively increasing liquidity: Rates were lowered, money supplies were increased. However, at present, liquidity is being removed from the system -- not added. That is consistent with our expectations for a small bounce 3-6 weeks, and not the beginning of a brand new cycle. I'm not convinced things will get as bad as you predict, but the more I hear from the bulls, the more cautious I become. There's another piece in the WSJ today about emerging markets being much better positioned financially now than they were in 1998. Which is obviously true. But the present problem is not their finances but their dependency on American demand for their exports. There won't be a melt-down, but that's not a reason to put money in markets that are still up 60% in the past two years and have the prospect of tightening margins.